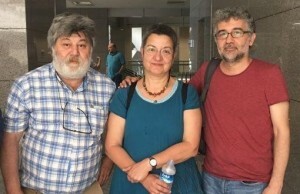 The three arrested Turkish human rights defenders/journalists. International Partnership for Human Rights (IPHR) has joined other NGOs in expressing concern about the recent arrests of three human rights defenders and journalists in Turkey: Şebnem Korur Fincanci, President of the Human Rights Foundation of Turkey (HRFT) and a leading Turkish anti-torture activist; Erol Önderoğlu, journalist and Turkey representative of Reporters Without Borders; and Ahmet Nesin, journalist and writer. They were all arrested on 20 June 2016 after participating in a solidarity campaign on behalf of the Turkish newspaper Özgür Gündem. Together with partner NGOs, IPHR calls for the immediate and unconditional release of these three individuals. All charges against them should be dropped. IPHR has signed on to a joint statement with this message issued by members of the Brussels-based Human Rights and Democracy Network (HRDN). The other signatories to this statement include: the Association for the Prevention of Torture (APT), the Christian Solidarity Worldwide (CSW), the European Association for the Defence of Human Rights (AEDH),EuroMedRights, the Human Rights House Foundation (HRHF), the International Federation for Human Rights (FIDH) and the World Organisation Against Torture (OMCT), within the framework of the Observatory for the Protection of Human Rights Defenders, the International Federation of Action by Christians for the Abolition of Torture (FIACAT) and the International Rehabilitation Council for Torture Victims (IRCT). The HRDN members statement is available here. IPHR has also signed on to a statement on the arrests issued by over 30 members of the Civic Solidarity Platform (CSP), a network of human rights NGOs from across Europe, the former Soviet Union and North America. The CSP statement, which was coordinated by the Netherlands Helsinki Committee, is available here.